Some people take information and have a tendency to read deeply into it. Sometimes they analyze and come out with more facts and details, while others times they can read into things without enough information to properly do so. This can leave them feeling anxious about a person without really knowing the full extent of what is going on. 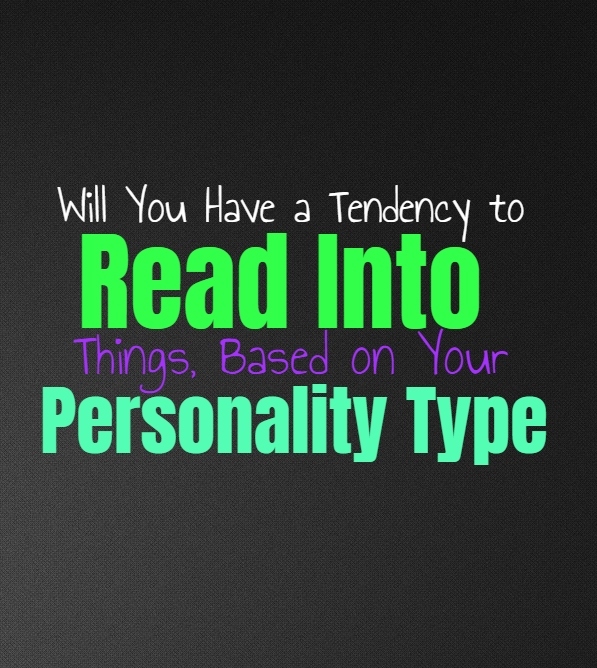 Here is how likely you are to read into things, based on your personality type. INFJs have busy inner minds and so they do have a tendency to read into things. When they trust their intuition and sense of empathy they can often read into things accurately though. It is when the INFJ is not trusting themselves and is more focused on their anxieties, that they start to read into things the wrong way. When this happens they find themselves becoming paranoid about the intentions of others, unsure if their loved ones truly care or if they are upset with the INFJ for some reason. The INFJ who trusts themselves it capable of appropriately reading the situation. ENFJs are often great at reading people and situations, especially when they trust in themselves. They don’t like to read into things without proper information or without trusting in their sense of empathy and intuition. They want to be accurate and don’t like to analyze a situation until they start to misconstrue things. For the ENFJ it is important to know the truth, and not to read into something incorrectly. When they do this it is because they are under high amounts of stress and are not longer trusting in themselves. INFPs do sometimes read into situations, especially when they are stressed or anxious about it. They have minds which often run through so many different possibilities, and these choices and ideas can be difficult to really narrow down. Sometimes their active inner minds and imaginations can cause the INFP to read into something or someone’s behaviors, without really being sure about them. INFPs follow their hearts and emotions, which sometimes leaves them reading into things. ENFPs do sometimes read into situations, since they have curious and analytical minds. They find themselves taking information and analyzing it inside of their heads, without people even realizing they are doing this. ENFPs have such active imaginations and always consider the many different possibilities of a situation. They can see various patterns and potentially outcomes, but this can sometimes lead them to read into things without really being sure. Their intuition gives them information but sometimes they are missing pieces and want to fill in the blanks. INTJs do read into things but they want to do this in a factual and accurate manner. They don’t just read into a situation without knowing all of the facts and being sure that they are accurate. INTJs don’t believe in making assumptions unless they have all of the information in front of them. They want to be sure before they jump to any conclusions which might end up being inaccurate in the end. INTJs can sometimes fill in the blanks when it comes to emotional situations, but most of the time they try to avoid them entirely. ENTJs are factual people who don’t want to read into things without having all of the information and details. They don’t like just making assumptions or reading into the situation without being sure of their choices and knowledge. For the ENTJ reading into things and overanalyzing doesn’t really help them, they want to be accurate and efficient and not waste their time of things they cannot prove or be sure about. INTPs do sometimes read into things, especially when there are pieces of information missing. When they don’t have all of the facts they often want to search for ways of uncovering these details. For the INTP sometimes this means filling in the blanks themselves, and while this can be accurate it can also lead to them jumping to conclusions. INTPs struggle when it comes to understand emotions, and so the feelings of others can leave them read into into things a bit too much. ENTPs do sometimes read into things when they see that pieces of information might be missing. They also struggle when it comes to understand the emotions of others, and sometimes they search for ways to fill in the blanks. This can lead the ENTP to sometimes reading into things, or analyzing them far more than they need to. They can see patterns and different possible outcomes, and so this potential can cause them to read into things. ISTJs don’t like to read into things, instead they prefer to focus on proven facts. They don’t like trying to analyze information without being sure of the choices they are making. For ISTJs being accurate is important and so they don’t read into something knowing that it might lead to inaccuracies. ISTJs would rather keep focused on what they can achieve and on being as efficient as their tasks as possible. ESTJs don’t like reading into anything since they prefer to focus on facts and proven methods. For them reading into things can mean being inaccurate and inefficient and they just aren’t okay with these things. Instead they focus on the goals they can achieve and the things they can truly rely on. They focus on researching and uncovering information and so they don’t believe in reading into situations. ISFJs do sometimes read into things, especially when they are stressed about it. They do sometimes take on too much at once and it can leave them feeling a bit drained. ISFJs work hard to take care of their loved ones and most of the time they rely on practical methods and don’t like taking risks which might result in mistakes. They try to avoid reading into things but they do have a strong sense of empathy which can cause them to fill in the blanks when they sense something is wrong. ESFJs sometimes read into things when they have a sense that something is wrong but are not sure what it is specifically. ESFJs have a strong sense of empathy which can cause them to sense when something is wrong, but this doesn’t mean they always have the details. Not knowing exactly why a person is upset, can lead the ESFJ to reading into the situation so that they can try to help. ISTPs don’t like to read into things, instead they focus on problem solving and using facts to do so. They especially don’t want to read into things inaccurately or try to pick up information that just isn’t there. ISTPs aren’t great at understanding emotions but they don’t try to read into them or fill in the blanks in ways which will only leave them frustrated. ISTPs don’t want to misunderstand people or situations, and so for them reading into without the facts is pointless. ESTPs do sometimes read into things, especially when they are stressed about a situation. If someone they love isn’t behaving the way they hope, then the ESTP might start reading into this and analyzing it. They have active inner minds and imaginations which can cause them to read into things without being sure. When it comes to most situations ESTPs care about facts and evidence, but when it comes to emotions they can sometimes read into them. ISFPs do sometimes read into situations, especially when it pertains to someone they care for. They want to understand people but they can jump to conclusions when they are feeling a bit anxious. ISFPs follow their hearts and their inr inner morals, and want to find a way to creating the right path for themselves. Sometimes this free-spirited way of thinking can make it easier for the ISFP to let go of things and try to avoid reading into something without being sure. ESFPs follow their hearts and emotions, but sometimes this can cause them to go back and forth with things. When they aren’t sure about a person or situation, they can read into it without knowing all of the facts. If they feel ignored or hurt by someone they might start to read into their behavior without really know the truth. ESFPs don’t intend to read into things, they simply are more ruled by their emotions which can cause them to bounce around a bit.